Among this spring's hottest shoe trends is the ghillie, which is "a shoe without a tongue and with decorative lacing up the instep." Thank you, thefreedictionary.com! Keep reading for 10 ghillie-friendly shoes under $150. Which pair would you wear? True to her Desperate Housewives persona, Felicity shows off her toned bod in a bandage style satin dress with a deep v-neck plunge neckline. Here are 5 dresses ranging from $27.80 to $235 that will help you get a similar look, hopefully one of these options will work for you! 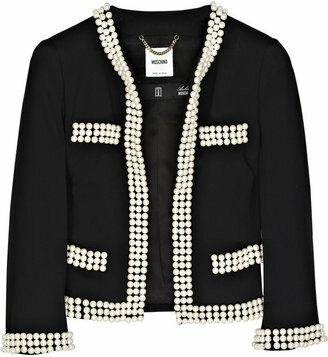 Moschino's crepe pearl-embellished jacket sells for $2,495 at Net-a-Porter.com. Very iconic in the tradition of Coco Chanel, but the pricetag is way out of reach! INC takes this classic style of collarless jacket and gives it an edgy makeover with stud trim instead of pearls—not to mention a much more manageable price. $119 at Macys.com. This Vince Draped Leather Jacket sells for $995 at Nordstrom.com. Get the look for less with this Leather Cascade Jacket, available in either soapstone or black, on sale now at J. Jill for $249.99. UPDATE: Reader Emily K. spotted this great find at Macy's which has a similar cut, although the fabric is silk rather than leather (which might be preferable depending on the look you're going for!). It's the INC International Concepts Cropped Silk Motorcycle Jacket, available in either cement or black, $89 at macys.com.